Today’s Flash Back Friday comes from Episode 183, originally published in November 2013. 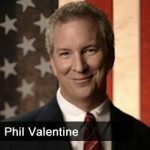 Nationally syndicated radio talk show host Phil Valentine is one of the “Heavy Hundred” top talkers in America. From Nashville, North Carolina (via Raleigh and as a program director of a station in Greensboro) to Nashville, Tennessee’s SuperTalk 99.7WTN, he has been a widely successful top radio host all throughout his career. After only a year, he had one of the highest rated morning shows in Nashville. In 1991, WLAC-AM allowed him to substitute for a weekend program. The next Monday, they fired the current morning host and Phil was to be his replacement. He hosted the morning talk show on WLAC-AM and the afternoon music show on WLAC-FM. Indoctrination of our youth on the issue of global warming is coming to an end if filmmaker Phil Valentine has anything to say about it. His award-winning documentary, An Inconsistent Truth, calls out Al Gore on the lies and deception that have dominated the discussion since the release of An Inconvenient Truth in 2006 and Valentine is on a crusade to educate the world about the facts. Valentine’s film not only rights the wrongs of Gore’s film; it explores the culture that drives the global warming movement as well as its motivations.